What is an offshore company? Why should I use SFM to open my offshore company? Where is the best place to register my company? Why are your fees lower than those of your competitors? How can I settle my company fees? Does my company have to provide accounts to the tax authority of the jurisdiction in which it is incorporated? Do I need to go to your physical office to open my offshore company? How long will it take for me to receive my corporate documents? Can I choose the name of my company? Why do I need to provide certified true copies of my documents and who can certify them? Can I use the company address to include it in my invoices? to use it as my commercial address? or to receive correspondence? What is a shelf company? What is a UK Agency Company? What is the difference between a shareholder and a director? Can the same person be a shareholder of the company and act as its director at the same time? When do I have to pay my company's yearly fees (Renewal Fees)? Do I have to pay taxes on profit or interest earned by my company? Who should use an offshore company? What is the meaning of the legal suffixes (Ltd, Corp, etc.) after a company name? Will I get a refund if I do not get my company registered and the bank account opened? Can I get a residency when I register a company through you? Do I need to come to the bank in person to open an account? Does opening an offshore company mean that a bank account will automatically be opened for the company? In which countries can you open a bank account for my company? Which banks do you work with? Is it possible to open a private account as well as an account in the name of my company? What fees apply for maintaining the bank account? Can I have a bank account in different currencies? How can I use the funds from my offshore account? What is the Travel Cash Card? What is the corporate debit card? What is a nominee director? Will a nominee director sign contracts, invoices, etc.? What is a nominee shareholder? What is the Virtual Office? What does "creation of company logo" mean? What does "creation of company stamp/seal" mean? What is the notarisation and Apostille? Can I transfer my current company to another jurisdiction? More specifically, offshore companies have three characteristics: Firstly, they should be registered as an entity within the jurisdiction of incorporation. Secondly, the "incorporators" should be domiciled outside of the jurisdiction of incorporation. Finally, the company should transact exclusively outside of the jurisdiction of incorporation. However, most associate the term 'offshore company' as a means of increasing tax efficiency. Why should I use SFM to open my offshore company? 1. Our professionals have more than 15 years of experience in offshore consultancy. During this time we have been able to develop a network of offshore service providers that remains unparalleled. 2. Our company is a member of many international recognized organisations. We provide tailor-made services to our clients, aligned with the latest jurisdictions’ laws. 3. We are one of the most competitive offshore providers. Where is the best place to register your company? We often get the question, “where should I register my company?” or what is the “best offshore jurisdiction?”. Our answer is simple: every client, every situation is unique, there is therefore no straight answer to that question. All these factors have an influence on which jurisdiction you should opt for. The SFM team will gladly review the options available to you to assist you in deciding which jurisdiction would fit you best. For clients who would like a rapid incorporation process, a bank account, keep the fees to the minimum and no accounting requirement, offshore jurisdictions such as Seychelles, Belize, or the BVI are often a favorite pick. You may also find that some of your clients do not wish to pay you on an offshore company account, and would require you to select a more established jurisdiction. In that case you could look at jurisdictions such as Hong Kong or Cyprus, which are considered to be Onshore Jurisdictions (even if tax rate is low or nil, there is a need to submit accounts on a yearly basis to the jurisdiction’s tax authorities). In other instances, some of our clients may need to provide services in the Middle East, in such case a RAK (Ras Al Khaimah) offshore company may be best suited, as it is internationally well recognized. All the jurisdictions we work with enjoy the above-mentioned advantages. Disclaimer : SFM Corporate Services and its affiliates do not provide tax, legal, or accounting advice. Materials provided by SFM Corporate Services and www.sfm.com have been prepared for informational purposes only, and is not intended to provide, and should not be relied on for tax, legal, or accounting advice. You should consult your own tax, legal, or accounting advisor with regard to your own tax, legal, or accounting scenario. You can either pay by bank transfer, credit card, cheque or banker's draft or also by cash at our offices, if you prefer. Does my company have to provide accounts to the tax authority of the jurisdiction in which it is incorporated? Many jurisdictions do not require financial reporting or auditing. However, in certain jurisdictions, such as Hong Kong, Cyprus, Gibraltar and the UK for example, it is indeed mandatory for companies to produce yearly accounts and to have them audited, and in some cases, to pay taxes (please refer to our jurisdiction comparison table). While a company may not be subject to tax reporting to its local authorities, you should consult your own tax, legal or accounting advisor to determine whether you or your company have any reporting obligations in other jurisdictions, including the jurisdiction in which you are a tax resident. NB: it is possible that under FATCA or CRS regimes, most of the offshore jurisdictions may report information about their offshore companies (and the company’s bank accounts) to the relevant home country tax authorities. No. You are welcome to meet us in any of our offices, but that does not mean that you will have to travel there to open your offshore company. Everything can be finalised by correspondence. Every jurisdiction has its own incorporation timeframe. Please refer to our jurisdiction comparison table. Once the company has been incorporated, it will generally take about two to six days for the corporate documents to become available. Yes, It is even recommended that you do so. On the application form you are asked to input two company names, in order of your preference. We will then check with the Company Registry of the offshore jurisdiction if those names are available for incorporation. If not, we shall send you some alternative names. We also have a list of shelf companies or pre-approved names that we can send to you upon request. Names that include any prohibited word, phrase or abbreviation such as Bank, Credit Union, , Municipal, Parliament, Building Society, Chamber of Commerce, Registrar, Chartered, Police, Royal, or any word or abbreviation conveying a similar meaning . Names that include any activity that would require a specific license, such as but not limited to : Casino, College, Foundation, Fund, Gambling, Hospital, Insurance, Airline, Bitcoin. Why do I need to provide certified true copies of my documents and who can certify them? Generally speaking we require your passport copy as well as your proof of address such as a utility bill to register your company. A certified true copy may be performed by a notary, a practicing attorney-at-law, a public administration or a banker. The certification must be recent, and the proof of address must be less than 3 months old; the certification must confirm that the copy is a true copy of the original document. Additionally, the certifier must indicate his name, capacity, date of the certification along with his/her signature next to their official seal. Some jurisdictions have specific requirements and we recommend seeking additional information and instructions from SFM and to submit scan copies for prior review. Can I use the company address to include it in my invoices? to use it as my commercial address? or to receive correspondence? The company registration address is the legal address of the company in the jurisdiction where it will be registered. This address must be used for all company legal documents including contracts, invoices, and others for the purpose of identifying the company correctly.it is also used for the service of legal notice by third parties. Some jurisdictions may restrict a company’s activities to business performed outside of the jurisdiction itself (Ex: Ras Al Khaimah offshore companies). In that case, the company’s registration address cannot be used as a commercial address else it would appear as if the company was trading from inside the jurisdiction. In other cases, some jurisdictions may demand that companies appearing to trade from within their territory now meet “substance” requirements in order to be deemed a resident company, which may include having local staff among other. Finally, it is not possible to use the registration address as your correspondence address because handling your company’s correspondence is not in the scope of service of a registered agent, unless. You can however request one of our virtual office services in Geneva or London to obtain a correspondence address. Reduction in the time it would take to create a new corporation. The appearance of corporate longevity. What is a UK Agency Company? 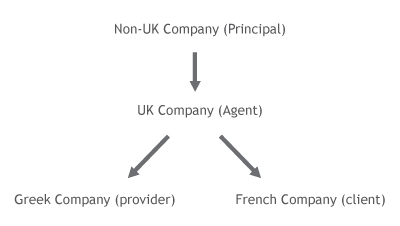 The agency structure is a simple set-up where a UK company acts as administrator or agent for a non-UK principal which was registered in another jurisdiction. The UK company will draw on its well respected image and business credibility to trade with clients on behalf of the Principal which in turn retains all the benefits of its own jurisdiction. The Principal and the Agent sign an agency agreement specifying the exact terms of their agreement including the set out of proper commercial fee for the Agent. All business is then conducted in the name of the UK company, but on behalf of the non-UK company. Clients enter into a contract with the UK company, are invoiced by them and pay the invoices into the bank account of the UK company. Most of the income is then remitted to the non-UK company according to the specificities of the agreement. It should be noted that if the UK company starts trading within the UK or with any UK businesses, this income would be subject to UK taxation. The Agent must not trade within the UK or with any UK business. The Agent’s commercial fee needs to be concretely paid out. The Beneficial Owner of the Principal should not be subject to UK tax. The relationship between the UK and the non-UK company has to be purely commercial. The success of this structure is owed to the fact that the agent pays corporation tax in the UK according to the amount received for its own commission, after deductions on expenses. Therefore, the HMR&Customs will assess the UK company for taxes whereas the revenue sent to the principal is subject to the rules of the jurisdiction of the principal. You will be asked to settle the yearly fees prior to each anniversary of your company, not at the end of each calendar year. There may however be exceptions where a jurisdiction requires the annual fees to be paid at a fixed calendar date. To avoid any last minute rush, we will send you a renewal invitation two months before the anniversary. Most of the jurisdictions we work with do not impose taxes on profits made or interest earned by the company. Some, like Hong Kong, only tax profits made within the jurisdiction, whereas Cyprus charges a 10% flat tax. While a company may not be subject to tax reporting to its local authorities, you should consult with your own tax, legal or accounting advisor to determine whether you or the company are subject to tax in any other jurisdiction including the jurisdiction in which you are a tax resident. Creating an offshore company allows you to begin an activity without having to deal with the set-up of a complicated infrastructure. An offshore company allows you to quickly create a stable structure with a simple administration and enjoy all the benefits of the offshore jurisdiction. You can also carry on your consultancy or counselling business through an offshore company. You will find it easier to manage your company, while being registered in a stable jurisdiction and benefiting from all the strengths of this jurisdiction. International commerce can be carried out through an offshore company. It will handle purchases and sales operations. SFM can also arrange for obtaining a VAT number for companies that we register in Cyprus or in the United Kingdom. Any kind of intellectual property right (a patent or trade mark) may be registered in the name of an offshore company. The company may also buy or sell this type of right. It may also grant rights of use to third parties against payments. An offshore firm that always stays afloat (provided all costs associated with running it are paid) may, in some countries, be used in relation to inheritance tax laws. With a view to optimising inheritance tax liability, the offshore structure may also be combined with a trust or a foundation. Offshore companies are very often used for share or foreign exchange transactions. The transactions may for instance be perfomed with an account opened under a company name. SFM Corporate Services and its affiliates do not provide tax, legal, or accounting advice. Materials provided by SFM Corporate Services and www.sfm.com have been prepared for informational purposes only, and is not intended to provide, and should not be relied on for tax, legal, or accounting advice. You should consult your own tax, legal, or accounting advisor with regard to your own tax, legal, or accounting scenario. What is the meaning of the legal suffixes (Ltd, Corp, etc.) after a company name? Please refer to our legal suffixes table. Will I get a refund if I do not get my company registered and the bank account opened? We at SFM are acting as your corporate service provider and we provide assistance with the company registration as well as bank account opening. During the process of registration of the company, we depend on the authority approval and also the client cooperation to obtain the required documents. When such documents are provided on time, we will be able to efficiently handle the procedures. SFM has successfully registered companies internationally in more than 20 jurisdictions. Can I get a residency when I register a company through you? Kindly note that a company does not provide the eligibility to apply or to obtain the residency in the country where the company is registered. We provide the assistance with the residency in the UAE through the registration of a Local / Free Zone company and for more details kindly refer to the following website https://www.dubaicompany.com/ and you may contact us for more details. Most bank we work with are able to accept clients whose application is completed fully by correspondence. However, some banks will want to meet you in person. If you wish, a personal meeting can be organized with a representative of the banks we work with. Does opening an offshore company mean that a bank account will automatically be opened for the company? No. If you tick the bank account opening option, we shall-in close collaboration with yourself-to review the banks which most suit your needs from among our network of prime banks. The bank will then decide if the account can be opened, depending on how comfortable they are with the nature of your business and the personal information provided by you. However, in more than 95% of cases, our clients obtained their account. Applications may be made in Switzerland, the Seychelles, Cyprus, Panama, Belize, BVI, St-Vincent, Latvia, Hong Kong, and elsewhere. Please refer to our website for the updated list. For legal reasons, we cannot disclose the names of the establishments we work with. However, be assured that we only work with first class banks, which are able to offer you all the services you may require (internet banking, credit and debit cards). Is it possible to open a private account as well as an account in the name of my company? Yes. It is possible to apply for a private account in addition to the account in the name of your company. Once the bank account has been opened, you can choose a multi-currency account. This will allow you to keep several currencies in the same account. When a new currency is used, the bank will automatically open a "sub-account" so that you do not have to pay any exchange fees. What is the Travel Cash Card? The Travel Cash Card is a card issued by Swiss banks only. The main advantage of this debit card is that it is anonymous. You can therefore withdraw cash or buy goods without leaving any trace. An offshore company account can also have a Travel Cash Card. What is the corporate debit card? The corporate debit card is a card issued to the company which allows its user to withdraw cash or buy goods within its limit. To be eligible to obtain this card from a bank, you must register a company and open a corporate bank account, this card will be linked directly to the corporate bank account and the card can be funded through the corporate bank account only. Will a nominee director sign contracts, invoices, etc.? A nominee director may sign contracts (or other commercial documents) on behalf of a company if needed and provided that 1) the nominee director reviewed and consents to the signature of the said contract, and 2) to a fee per hour for the time needed to review and process the same. However, if you are not appointed as a director, you may still have full power to manage the company and its bank account as an attorney-in-fact via a power of attorney granted by the nominee director. The Virtual Office allows your company to have an address in Geneva, London or Hong Kong and to receive mail there, which, in some cases, can lend more credibility to your company. The Standard Virtual Office allows you to have a company address in Geneva, London or Hong Kong (with the mention "c/o") and to receive mail there. The Virtual Office Premium allows you to have a company address in Geneva, London or Hong Kong and to receive mail there. The Virtual Office Premium includes the company name on the post box. The Full Virtual Office allows you to have a company address in Geneva, London or Hong Kong and to receive phone calls and faxes. The Full Virtual Office includes the company name on the post box, its own phone and fax number, telephone answering in the name of your company by a secretary and call forwarding. What does "creation of company logo" mean? Upon selection of this option, we will design and suggest five logos for your company. These logos can be designed according to the company's activity or without any theme in particular. You can choose one logo among the ones suggested. The logo will be sent to you in different formats and will be placed on the company’s letterhead and business cards prepared by us. What does "creation of company stamp/seal" mean? Upon selection of this option, we will send you a stamp or seal bearing the company's name and address, as well as its logo, if this option was also selected. What is the notarisation and Apostille? A notarisation means that a notary will check all the documents we issue for your company and that he will confirm their authenticity. An Apostille is an internationally recognised certification and legalisation of the corporate documents by the government of the jurisdiction where your company has been incorporated. We highly recommend that you choose this option if you consider opening a bank account or if you need your corporate documents for any legal proceedings (such as concluding a contract, for example). Can I transfer my current company to another jurisdiction? The re-domiciliation or continuation is a legal process allowed between most jurisdictions and this will be subject to approval to transfer the company from your existing jurisdiction to your new desired jurisdiction. Once the company is re-domiciled, we can provide you, upon request, with an updated record of your company shareholders, directors, and secretaries or any other document pertaining to your company such as Certificate of Good Standing, Certificate of Incumbency, newly adopted Memorandum and Articles etc. This process takes at least 2 weeks to be completed and for additional information kindly contact our support team. Please note that a jurisdiction may prevent you from re-domiciling your company if it is not in good standing. Disclaimer: SFM Corporate Services and its affiliates do not provide tax, legal, or accounting advice. Materials provided by SFM Corporate Services and www.sfm.com have been prepared for informational purposes only, and is not intended to provide, and should not be relied on for tax, legal, or accounting advice. You should consult your own tax, legal, or accounting advisor with regard to your own tax, legal, or accounting scenario. Nothing on this webpage shall be construed as a contractual commitment or as a warranty. Services conditions are governed by the applicable terms and conditions.